Essentially any wall where the stones in a layer are not more or less the same size can be said to be random. 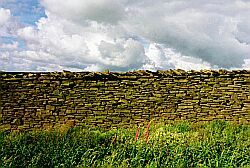 Most walls, even those built with relatively level bedded sandstones, are random built, however a general distinction can be made between those that are built out of flatter stone - simply random walls, and those built out of less regular stone - random rubble walls. 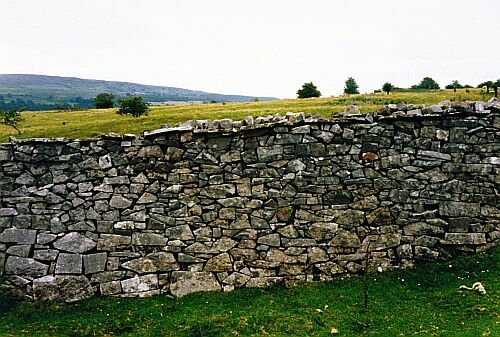 Here the face of the wall is extremely random, with a marked difference in the sizes of adjacent stones, and whilst there is a general grading of stone from large nearer the base to smaller nearer the top there is often a large number of smaller stones distributed throughout the face. Most well structured random walls are to some extent `random brought to courses`. 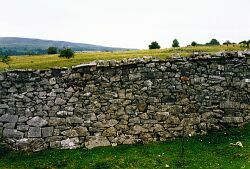 True random brought to courses walls are brought to a level on two, three, or more occasions (depending on their height and stone size) as they are built up. McAfee (p.42) again provides a useful stylised diagram. 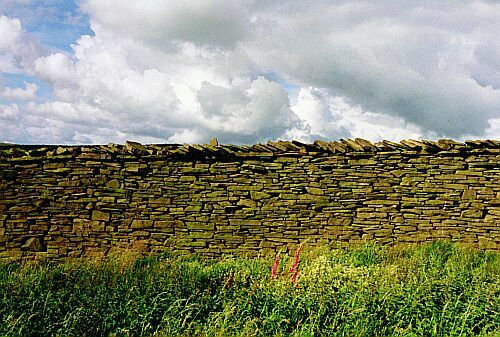 More normal practice is a rough levelling of the wall without using small stone in the smaller dips, instead placing a larger stone on them in effect breaking the coursing.